Don’t look a gift horse in the mouth. FOX has renewed The Gifted TV show for season two. From creator Matt Nix, The Gifted unfolds in Marvel Comics’ X-Men universe. The two-hour first season finale, “eXtraction/X-roads,” will air on Monday, January 15, 2018 at 8:00pm ET/PT. A FOX superhero drama, The Gifted stars Stephen Moyer, Amy Acker, Natalie Alyn Lind, Percy Hynes White, Sean Teale, Jamie Chung, Emma Dumont, Blair Redford, Coby Bell, and Garret Dillahunt. The sci-fi action-adventure series centers on Reed and Caitlin Strucker (Moyer and Acker) and their teenaged children, Lauren (Lind) and Andy (White). When the kids manifest powers associated with the X-gene, the Struckers must go on the run and seek refuge with the mutants Reed once prosecuted. 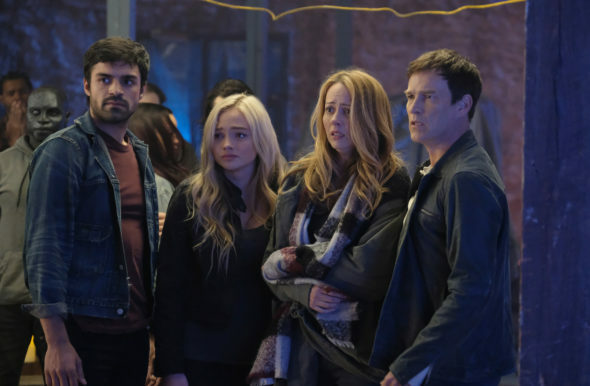 The first season of The Gifted is averaging a 1.01 rating in the 18-49 demographic and 3.28 million viewers. It currently ranks in about the middle of the pack out of the 18 scripted FOX TV shows we’re tracking. THE GIFTED is produced by 20th Century Fox Television in association with Marvel Television. Matt Nix (“Burn Notice“), Bryan Singer (the “X-Men” franchise), Lauren Shuler Donner (“X-Men: Apocalypse,” “X-Men: Days of Future Past”), Simon Kinberg (“X-Men: Apocalypse,” “X-Men: Days of Future Past”) and Marvel’s Jeph Loeb and Jim Chory serve as executive producers. Nix, who serves as the series’ showrunner, wrote the pilot, which was directed by Singer. “Like” THE GIFTED on Facebook at TheGiftedonFOX. Follow the series on Twitter @TheGiftedonFOX and join the discussion using #TheGifted. See photos and videos on Instagram by following @TheGiftedonFOX. What do you think? Have you been watching season one of The Gifted TV series? Did you expect FOX to cancel or renew it for season two? Sound off, in the comments. Where is the show? I thought the second season would have been on by now. It’s a great show.